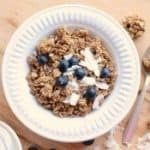 Healthy honey coconut granola recipe made with whole grain oats, honey, coconut oil, coconut flakes and more! 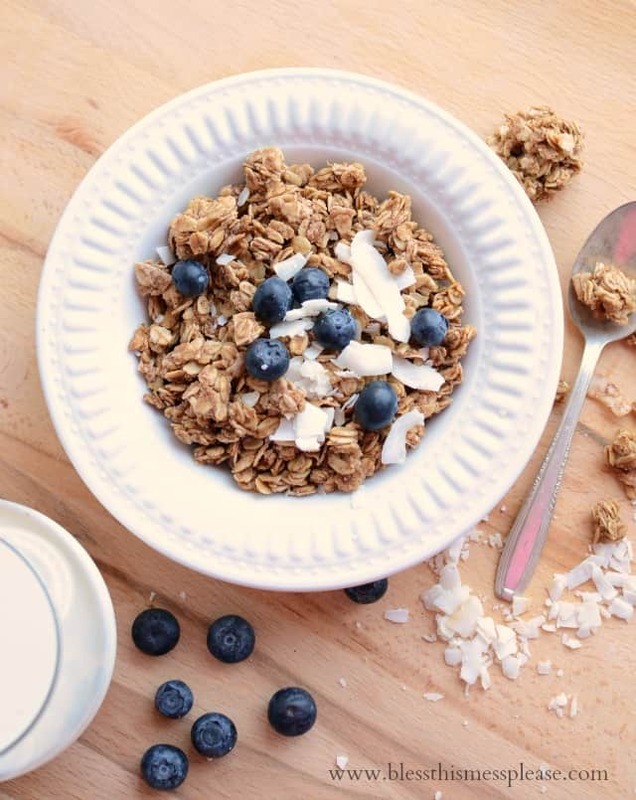 Today I have an amazing and healthy honey coconut granola recipe for you. 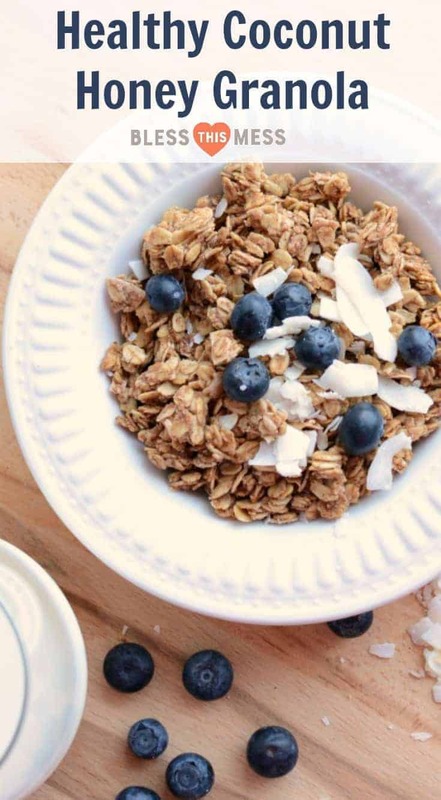 We love this granola! It’s one that I’ve been making for a long time and it’s a regular in my kitchen. 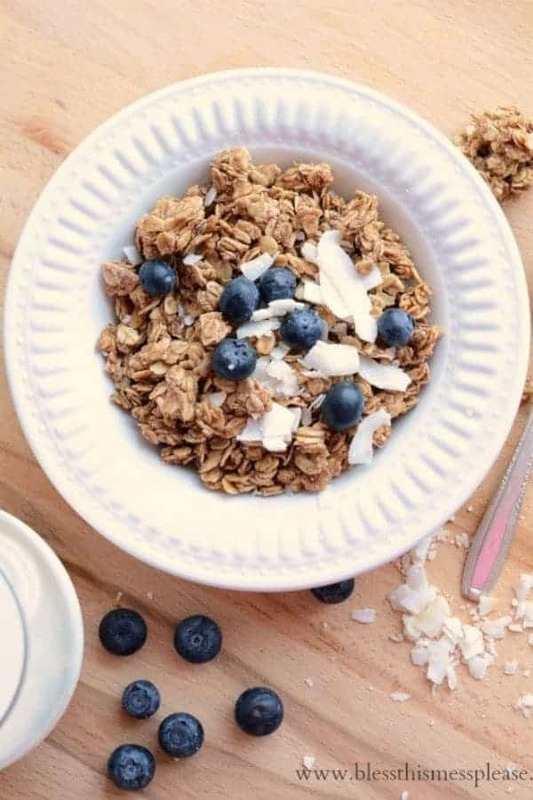 I eat it with milk or almond milk in the morning like cold cereal, we eat it dry right out of the container for snacks, and it is excellent with yogurt and fruit for a quick snack. It is honey sweetened and made coconut-delicious from both coconut flakes and coconut oil. 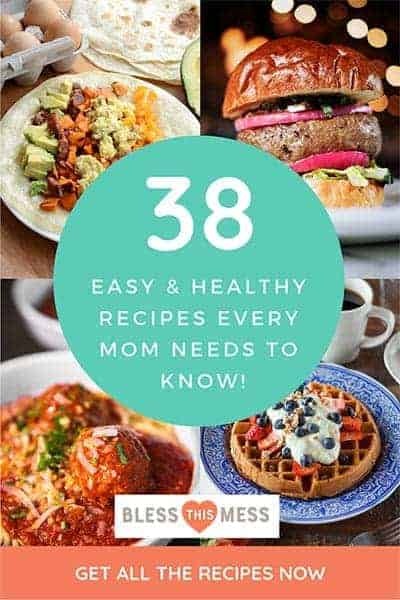 This recipe is a keeper, literally, it stores really well! I make a batch on Monday and it’s get for a week or two in the cabinet. If you are looking for a deliciously clean and healthy breakfast, snack, dessert recipe then look no more. And if you are looking to get a good laugh, check out the wedding pictures from last weekend. Enjoy! This recipe is very forgiving. If I am feeling cheap or plain I don’t add any nuts. Honey burns pretty easily. If your granola is looking dark or smelling like it’s burning, turn the oven down 25 degrees and take the pan out while the oven cools. Burnt honey granola isn’t the best. If you don’t have coconut oil you can a neutral oil like vegetable or canola oil in this recipe. 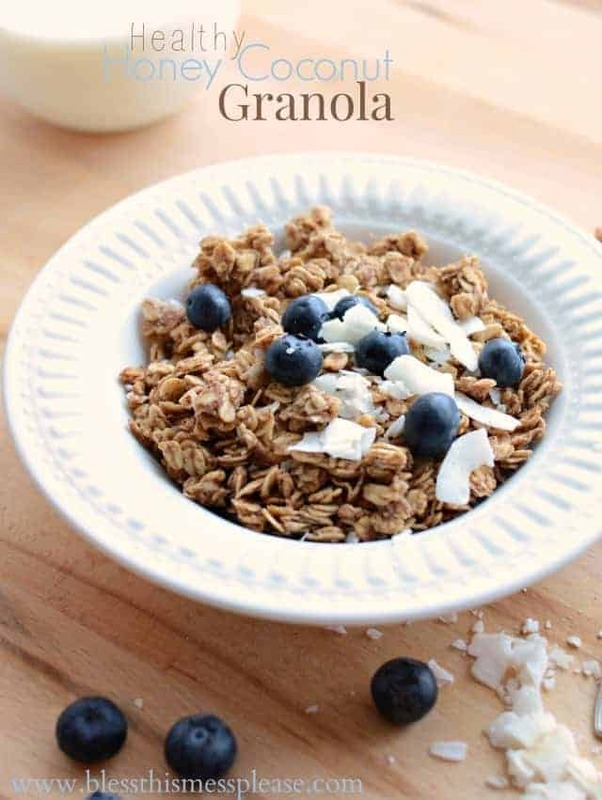 What do you eat granola with? Make a granola trail mix by adding other things to a baggie of granola like chocolate chips, more nuts or peanuts, or chocolate candies. We love this for hiking. Preheat oven to 225 degrees. Line a big cookie sheet with parchment. In a large bowl combine the oats, coconut, flour, salt, and cinnamon. In a small bowl whisk together the water, coconut oil, honey, and vanilla. (If you honey is thick, use hot water or microwave it just a bit). Pour the wet ingredients over the dry ingredients. Mix everything together making sure there are no dry spots. Spread granola onto the prepared cookie sheet. The pan will be nice and full. Bake for about an hour and half total, stirring every 20 minutes to make sure everything bakes evenly. 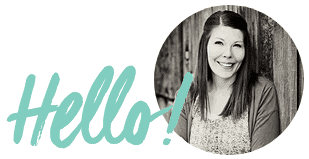 When you are stirring, don’t get too crazy because you don’t want to break up all of the clumps. When granola starts to turn a light golden color (about an hour into cooking) add your nuts. Continue cooking until everything is a nice golden color, taking care not to burn the nuts. 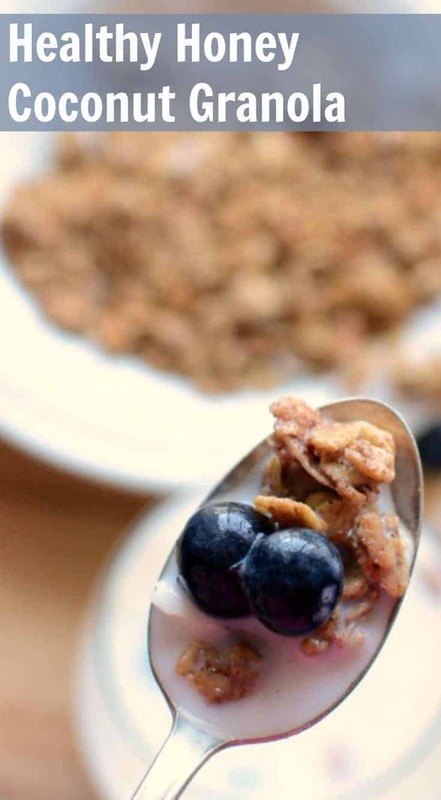 The granola will still be slightly sticky when you take it out and will crisp up after it cools. 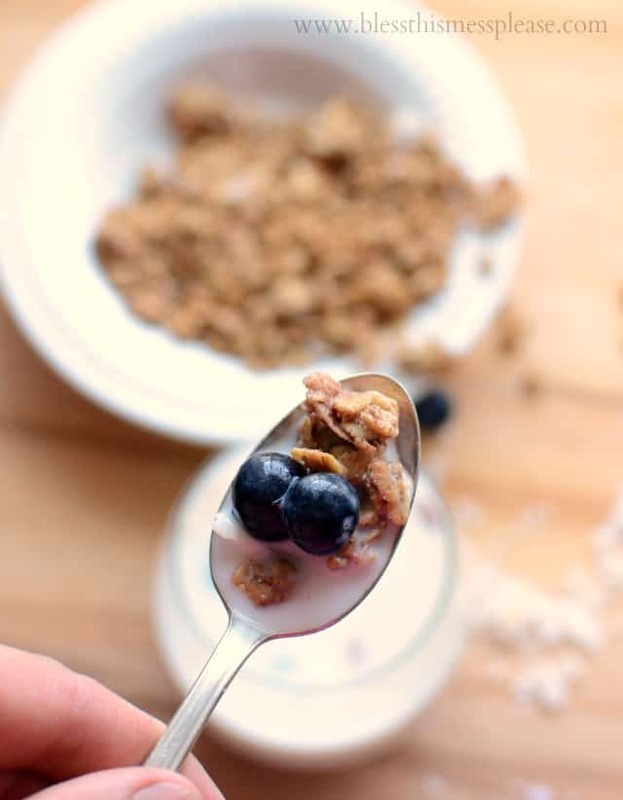 The plain-jane granola is excellent with yogurt and berries. hahahaha, oh man I feel your pain! Earlier this year I drove 17 hours by myself with my 4 boys to visit family, then 5 hours to visit more family, and then 15 hours back home. All by myself. It was murderous, but the time spent there was so worth it! I can’t believe your son broke his nose, the poor boy! At least he has some war wounds to show off. Also, to make you feel better a little better-today at the firework stand my boys tried to fish all the money out of the donations jar to pay for their fireworks. yes. thank you children. Enjoy your weekend! Bahaha fishing out the donation! Don’t you just love kids. And that drive… I felt like I got hit by a truck when I got home but you are right, so worth it! Enjoy the Holiday Katie! Thank you for this recipe. I cannot wait to try it. I just bought a program to figure nutrition info out. I’ll put this on my list to update asap and let you know. It’s so good, I just made it this weekend!